The man to the right, the one with the preposterous eyebrows, is Tim Brown, aka T.J. Brown, Comedic Author Extraordinaire. (At least, that's what his mum writes on his lunchbox.) He is also my very good friend. What? No, I'm not ashamed to say it. Hmm? No, we shall not mention the incident with the jellied eels and the monks. Moving on now. I met the infamous Brown last May in an atheist group on Goodreads, where I was promoting my book, offering it free in exchange for honest reviews. Tim took me up on it and offered me a copy of his e-book in return, which I accepted, read, and laughed all the way through. 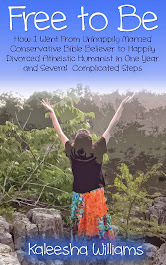 (And reviewed, because as an indie-author I know reviews are gold!) Tim said he would be reading my book on his upcoming holiday and sent notes keeping me posted regarding his progress. After we'd read and reviewed each other's books we could have gone our separate ways, but we didn't. We began discussing independent publishing and writing and the rest, as they say, is best served with tartar sauce. T J Brown was born in Dorset during the 1960s but was too young to realise how good the decade was meant to be. Instead, he had to make do with the 1970s, which only became interesting towards the end when many, Brown included, started wearing charity-shop clothes and swearing. Conscription into arts school was at this time mandatory and as a result Brown found himself reading German literature, creating miserable paintings and performing music that in retrospect, and at the time, was dreadful. After three lost years at art school Brown moved to London to begin five lost years on the margins of the capital’s fashionable underbelly. After all that, a career in publishing almost came as a relief. And so, after many years producing illustrated books on astronomy and aviation, Brown returned to his love of comic writing. The result is THE UNHAPPY MEDIUM. When even the laws of physics let you down, the absurd, the ludicrous and the frankly impossible may be all you have left. 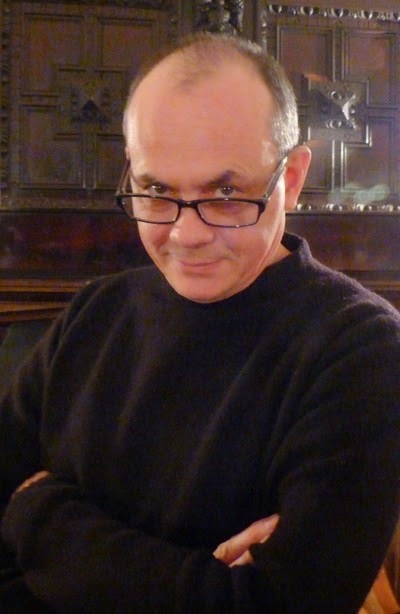 Dr Newton Barlow has everything a theoretical physicist could ask for – a glittering career both in the lab and on television, a beautiful wife, and best of all, the opportunity to promote his rock-solid certainty that supernatural and religious beliefs are nothing but complete and utter hokum. But Barlow is about to take a tumble. Mired in accusations of fraud, incompetence and malpractice, Newton is cast out from the scientific establishment and ejected from the family home. With his life in tatters, he descends into a wine-sodden wilderness. Thrown headlong into a new reality that simply shouldn’t exist, Dr Newton Barlow is about to come up against the best and the worst of human nature: tooled-up vicars, paper-pushing ancient Greeks, sinister property developers, a saucy rubber nun and possibly the most mean-spirited man ever to have walked the earth (twice). From the dusty plains of Spain to the leafy vicarages of Hampshire, Dr Barlow will have to contradict everything he ever believed in if he wants to save this world – and the next. I encourage you to go buy Tim's book on Amazon right now. It'll be the best $5 you'll spend this week. One of the most enjoyable books I've ever read. 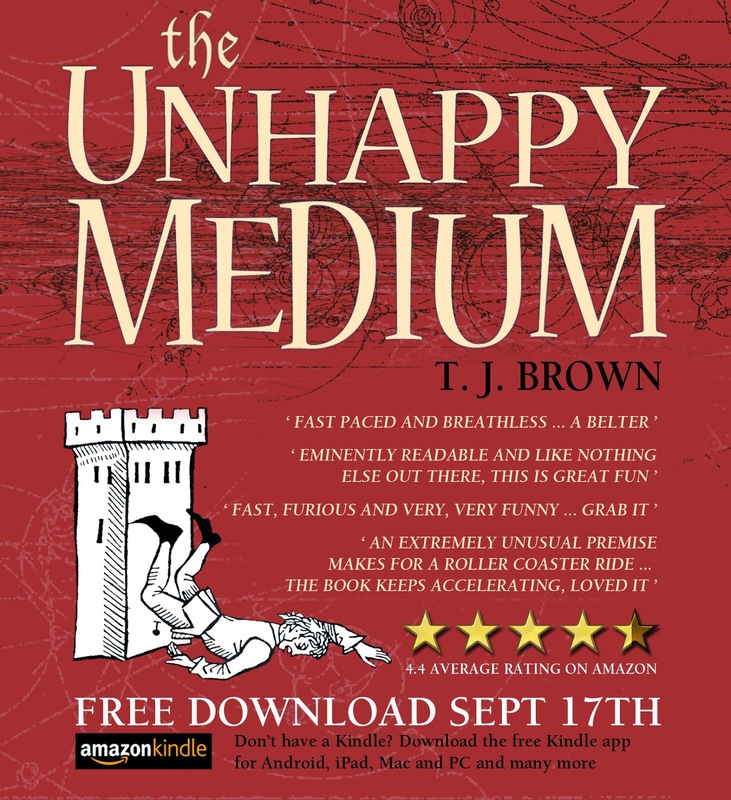 But, if you are apprehensive about taking the chance (and who wouldn't be, seeing the dubious character in the photo above), I'll let you in on the latest news: The Unhappy Medium can be downloaded free from Amazon tomorrow, all day long and to your heart's content. What are you still doing here? Go read The Unhappy Medium. And do be a good reader and leave Tim a review.